A few years ago Daniel Blumberg and Max Bloom were making happy indie pop songs with Cajun Dance Party while breaking teen girl's hearts. They were still very young and decided that they wanted something different. The status of Cajun Dance Party is unknown at the moment, but their new band Yuck is alive and kicking. And that new band sounds a lot more dangerous and less playful than their previous work. Twelve varying grunge and noise tracks are on the debut album, that clearly carries the influences of Sonic Youth and The Cure. And that makes them one of the bands that go back to the beginning of the grunge music. According to themselves it's a tip of the hat to their heroes of alternative music like Dinosaur Jr. and Sparklehorse. And they do that with a lot of success. The band sounds just like it was intended in that time. The gritty guitars are roaring nicely and are clearly hearable, while the vocals are distorted and mixed to the back. Gone is the innocent music they used to make. They're going full force regularly when the guitars are going wild like in 'Holing Out', while a track like 'Georgia' could have been on a The Cure album. Halfway they shift back in gear and there's room for more quiet work. But in these moments the band sounds convincing and in place as well, like in the nicely flowing 'Stutter'. After that they crank up the volume again to eventually reach a distorted climax in the closing act 'Rubber': a seven minute track that builds up to a wall of guitar noise. 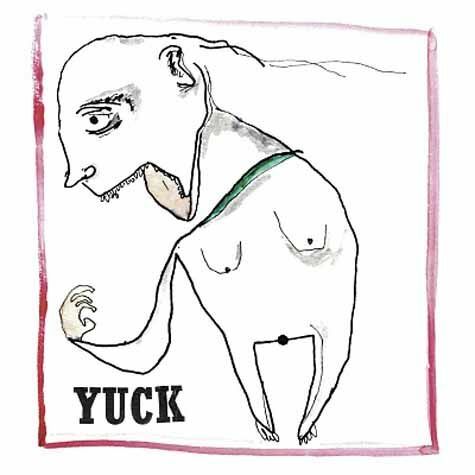 Yuck is delivering a convincing debut album. Instead of playing it safe and continuing their indie pop adventure Blumberg and Bloom together with their new band fortunately decided to take a gamble. En that results in a band with a mature and varying sound. I was able to hear what that sounded like on stage yesterday in Paradiso Amsterdam so check back for that live review soon!